Imagine what it would be like to be invisible. You would sit quietly, or not so quietly, and people would walk by not acknowledging your presence. And then what about when you spoke to them. Obviously, they would hear you, but they would ignore you...and pretend that they hadn't heard you. This is what life is like for most of our homeless population on the streets of Los Angeles. Our monthly outreach to the Skid Row area of L.A., with our group, In His Shoes, has shed a different perspective for me on the population on the streets. With the economic downturn, there are more and more people on the street. Not just men, but women...families. I often think that we are all just a paycheck away from the street if it weren't for our support systems, be they family, friends, church. 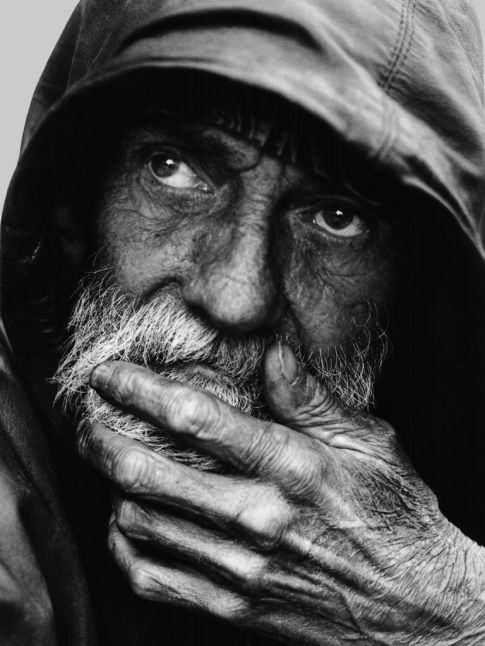 Not all who are living on the street are "crazy", "mental patients", or "social deviants." I have met many types. For the four years that we have been doing our monthly outreach in Los Angeles, I have met the "regulars" as well as those who are in transition. From what I see, there are 4 different types on the street. There are those that live there and LIKE living there. They are usually men in their 30's and 40's who thrive on the environment, seeing their friends on a day-to-day basis. They may be living in Single Room Occupancy apartments with very low rent, but hardly have enough for food. The newly homeless. This includes those that have newly lost everything, their jobs and homes. They are the ones that are trying hard to get off the streets, trying to make the best of the programs that are out there. But the programs are so impacted that they may or may not get the help that they need. Those that are living in the shelters but don't have the ability to provide for themselves and therefore end up begging for food and clothing on the street. I suppose what sparked this writing is a conversation that I had recently with Bob, one of my homeless friends. I see Bob on a daily basis as I walk to my car on Figueroa. Bob is disabled, in a wheelchair with one leg only. He is the kindest, gentlest and most positive soul. As passersby walk to their destinations, Bob sits there, her cup for donations on the sidewalk. He does not beg, but the cup is there. Instead he greets people, compliments them on their clothing, discusses the sporting events that happened, yet as I approach I notice that there are not many that even make eye contact with Bob. And I started wondering what that would feel like, to be a "non-person." I imagine it would disheartening, if not incredibly lonely. A couple months ago, I noticed that Bob was wearing glasses. I asked him about it. "A couple months ago, some people took me to Costco to get my eyes checked. They ordered glasses for me, but I wasn't able to go there to pick them up." They picked them up for me and now I can see. I asked him, 'So now that you can see all of us, tell me, are we as beautiful and handsome as you always tell us we are? I mean, now that you can see." He laughed and said, "Everyone is beautiful. I love Los Angeles. I'm blesed to be here." A couple months ago, I overheard Bob tell someone that his birthday was coming up. When I asked him, he told me his birthday was on December 7 - Pearl Harbor Day. He was going to be 53. As the weeks went by, Bob referenced his upcoming birthday a few times to me. I told him that I had the date in mind - December 7. Bob's birthday was two days ago. As I wished him happy birthday on my way to the car, and handed him a bad with his birthday gift (a pack of underwear that he had asked for), he said something to me that I will not forget. I wanted to share it with you. After thanking me for the gift, he said, "You always remember my name. And I appreciate that, ma'am. You know who I am." I can't forget this. Our homeless brothers and sisters are people, just like you and I. They are the children of fathers and mothers. They are the brothers and sisters of families. Those families may or may not know where they are, or care about them. But this doesn't discount the fact that they are human beings with needs, fears, hopes and dreams like all of us. They just lack the support systems that we so readily enjoy. They have names and birthdays. Happy Birthday to Bob. May your life be filled with the beauty and goodness that you so readily see in all of us. It's often difficult to know what to give to the homeless. I hear people tell me they don't want to give money because they fear the person will use it for alcohol or drugs. That may or may not be the case, however, if you would prefer to give items to the homeless in your community, here are some suggestions that I find are asked for on a regular basis on our homeless outreach. About a month or so ago, I was heading toward my car on Figueroa after finishing up at work. As usual, Bob was in his spot, sitting in his wheelchair, he greeted the passers-by with "Your hair looks nice," "What a game last night, huh? ", and "I like your earrings." I would say about 50% don't even make eye contact. That's pretty good considering most homeless people on the street. Bob is different. He's likeable. Very even tempered, and very complimentary. That's his schtick. That's Bob. On that day, he was asking someone if they had seen Puss n' Boots. He said that he thought it was a funny film and recommended that this man take his son to see the film. "My son is 18. He's not going to sit through Puss n' Boots." To which Bob replied, "Well, I'm going to be 53, and I sat through it...and really liked it!" At that time, I was approaching, and he starting asking me if I had seen the movie. I told him I hadn't, but asked him when his upcoming birthday was having overheard his conversation. "December 7! I was born on Pearl Harbor Day,1958." So I remembered. For the past 6 weeks or so, every once in a while Bob would mention that he had an upcoming birthday, to which I'd say, "I know. Pearl Harbor Day, 1958." Everytime I say this, Bob says, "Aw, ma'am...you remembered my birthday." I've told Bob my name, but he calls me "ma'am" which I would hate from anyone else, but from Bob, it's okay. So yesterday as I passed Bob, I asked him what he needed for his birthday. "Aw, ma'am, you remembered!...Well, I could use some pants, but I know a couple people that said they would get me some." I asked about food thinking I could get him a gift card to Corner Bakery (I know he likes their chili). But he said, "no, I have enough food...I get so much from people going by that sometimes I have to give it away." So that was out. Then he said, "Ma'am? I could actually use some underwear though." I said okay, happy to have a definite gift idea. And then there I was. On Figueroa, discussing underwear with Bob. What kind? Boxers? Tighty whiteys? What size? And it struck me as funny as I was walking away because I was having this conversation about something somewhat intimate with Bob who is just really an acquaintance...but an acquaintance in need of underwear. That evening, in Costco, I told my husband that I was picking up underwear for Bob. "Who's Bob?" he asked. "Bob, my friend in the wheelchair." "Oh, okay." Neddy know I have a soft spot for the homeless. Bob is 53 today. It's Pearl Harbor day. He has a long gray beard, long gray hair tied back in a pony tail. He has one leg and sits in a wheelchair with all his belongings tied to it. He has soft green eyes, and would actually be a handsome man if he wasn't so unkempt. He's about the most positive man I've met. Despite the adversity, he sits there every day as the world walks by, talking to whomever will carry a conversation with him. When I ask, "How are you today, Bob." He says, "Keepin' positive! God is good." He has every reason to think the opposite. Just last week when it got to be so chilly, I asked him where he goes at night. He said that last night he spent the night on the floor of his friend's bathroom, and in his positive way said, "but it was indoors and out of the cold!" That's how Bob is. Always positive. As I approached him today, he was talking to another homeless man who was standing close by. I watched as Bob counted out money from his cup and gave it to the man. The man looked at me and said, "I'm hungry and just need some money for food...for a burrito." Bob was sharing his money with him, and I gave him the rest. I've seen this many times before on our homeless outreach. The sense of community and belonging of the homeless toward one another. After the man had left, I handed Bob the bag with his gift. I had wrapped his underwear six-pack in colorful paper and added a card. Bob looked inside the bag. "Aw ma'am, you remembered my birthday...and you even wrapped my present...and there's a card too? And you always remember my name. I appreciate that, ma'am, that you know my name." Makes you think, doesn't it? The little things are what matter. To someone who is "invisible" to the general populace, having someone know/remember your name is a big deal. Having someone even acknowledge your presence is special. And I suppose having them remember your birthday is just icing on the cake! Happy Birthday Bob. May your life be filled with the beauty that you so easily see in all of us!